Launched by startup training service StartupPlays, the accelerator is promising access to a global network of mentors, experts and startup founders; introductions to investors, press, and strategic partners, and a range of discounts on services for startups. While it shares the ‘accelerator’ name with the likes of TechStars, this is a very different beast. Any startup can sign up for a monthly fee, starting at $9, but set to rise to $49 in the future. Unlike more traditional accelerators, there’s no approval process, but StartupPlays doesn’t take equity in member companies either, and there’s no need for teams to relocate. Mentors signed up to the program include no massive names from the startup world, although they’re largely experienced serial entrepreneurs. Aiming to see that the cream rises to the top and (hopefully) only the most promising companies get access to mentors, introductions and discounts, there’s a social element involved which acts as a kind of AngelList-meets-Hacker-News feature. 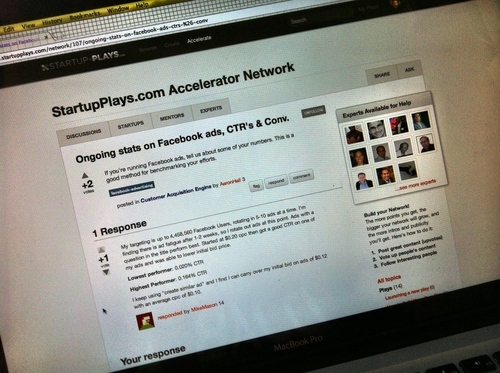 Startups gain points by posting updates on their startups and getting followers in the network. Other members “vote up” contributions they make to the network. Earn enough points and startups can begin to reap the rewards. It’s easy to be skeptical of this model, and we do wonder how well the quality level can be kept up when anyone can join, and access to ‘the good stuff’ relies on voting between members – potentially an expressway to gaming and begging for votes. Think of it less as an accelerator and more of a members club for startups, though, and there may well be some value here – and at $9 per month, it’s at least worth a peep behind the curtain if you’re sat on the fence.